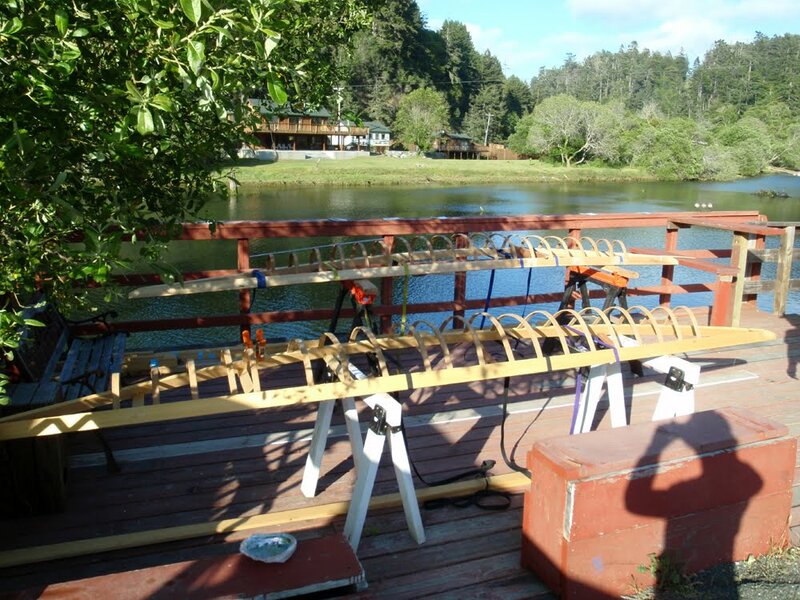 Progress continues on my skin on frame kayak which I am building on our deck over the Noyo River. 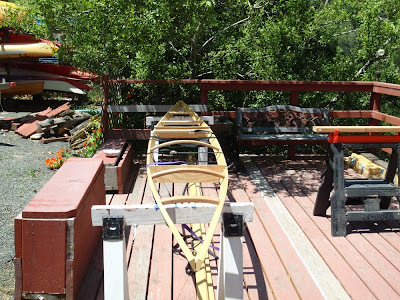 It is fun to hear the comments that paddlers make about her as they cruise by on the river. The chestnut chickadees, downy woodpeckers, wilson's warblers, orange crowned warblers, and violet green swallows flit about feeding in the alder tree by my new kayak. It is fun to hear and watch them. Perhaps they will be inspiration when naming her. When I cut the ribs, I put them in the mortises for a stegosaurus effect. At the moment when I took this photo, Stan and Jim of the Lost Coast Chapter of the Traditional Small Craft Association rowed by and were intrigued. Steaming and bending the ribs can be a little nerve-racking. 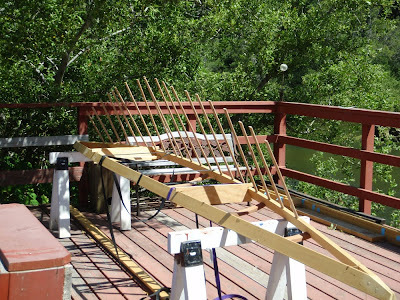 I broke several of my first attempts on the steeply V'd first ribs but then started to get the hang of it - sort of. My ribs definitely aren't perfect. The keel required some shimming and I am hoping that the chines will help pull things into shape a little bit better tomorrow. My friend John's ribs are very symmetrical and even (the boat closest to the river). But my purpose for building this boat is to do it on my own (with a little insight from my friends) and learn from and enjoy the experience. It will be fun to see how well my imperfect boat paddles.